Nice deep rumble that sounds great! 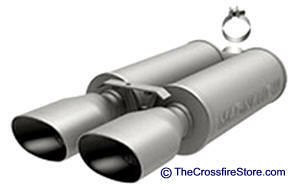 Magnaflow engineers their Cat-Back Exhaust Systems to bolt on easy, giving you more time to cruise. 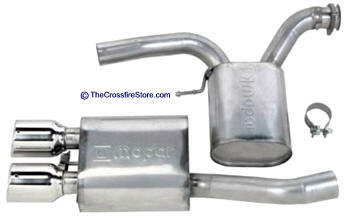 All pipes are mandrel-bent stainless steel tubing from the flanges to the tailpipes. 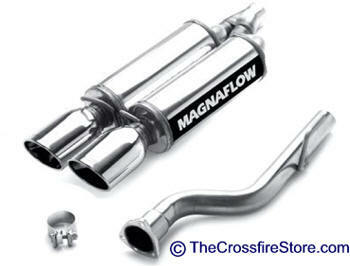 Magnaflow also throws at least one of their high-powered mufflers into the mix to complete the system. Mopar Performance cat-back exhaust systems, including the muffler, feature aircraft-quality T304 stainless steel construction with mandrel-bent 2.5" tubing, stainless band (torca) clamps, and polished tips (unless otherwise noted). These free-flow systems provide horsepower and torque gain, improved fuel economy, and a deeper tone. Tip outlet size 3.5", Tail pipe dia. 2.5" 15-25 HP Gain!